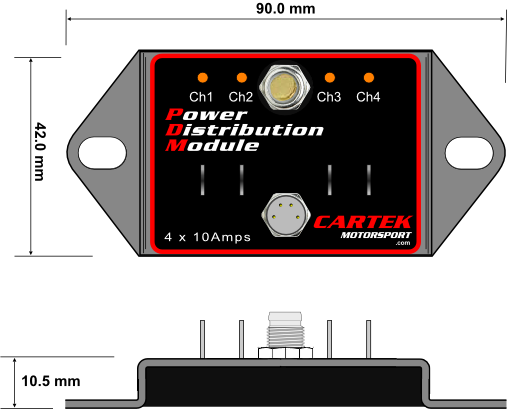 This Power Distribution Module is ideal for race cars and motorcycles which have minimal onboard electrical circuits but still require rugged and reliable protection and control. Simple connections and no configuration procedures makes this system very easy use and quick to install. Channels will automatically shut down if a short circuit or over-current is detected – LED Status indication on the PDM and Cartek Switch Panels makes fault finding simple. 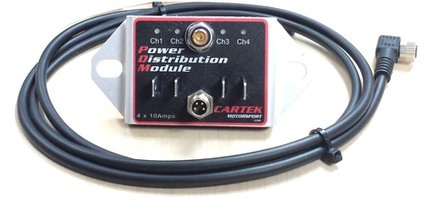 The Cartek Power Distribution Module Kit is a direct replacement for 4 x 10amp Fuses, 4 Relays and 4 Switches. This unit therefore reduces all the wiring in between the Fuses, Relays and Switches as well as simplifying the installation. When mounting the PDM, electrical contact must be made between the vehicle’s chassis/earth and the metal case of the PDM at its mounting points. 12v Power Input is supplied to the PDM via the M6 electrical stud. Power Output connections are made using 6.3mm spade terminals. 4x Black latching switches with LED status indication. 3x Black latching switches with LED status indication plus Green momentary switch. Panel marked with IGN, FUEL, ACC, START. 4x Coloured latching switches with LED status indication. 3x Colour latching switches with LED status indication plus Green momentary switch. 3x Coloured latching switches with LED status indication plus Green momentary switch. plus Battery Isolator GT ON/OFF button. Panel marked with FUEL, DASH, START, RAIN. 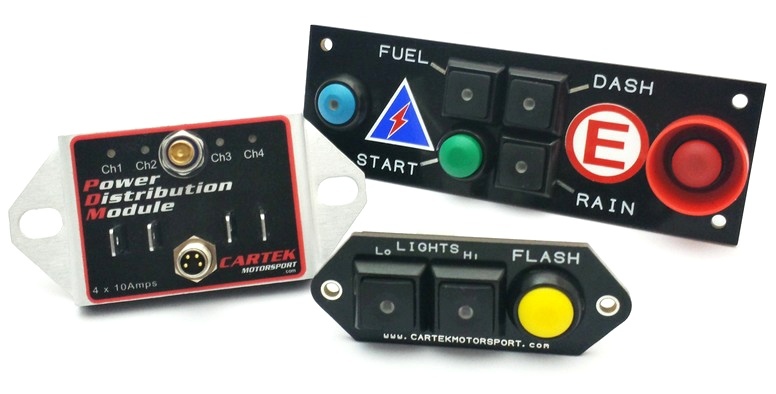 Cartek have now produced a dedicated Lights Module for kit cars and Rally Cars that use additional spot lights. 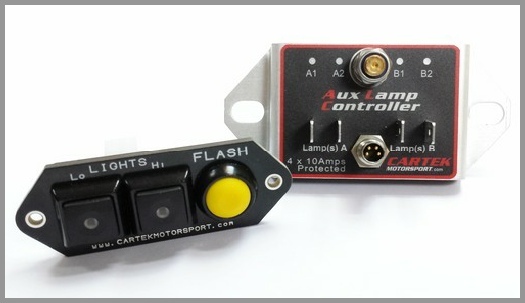 The switch panel enables Low beam, High beam, and an extra switch to flash the lights. The Low and High beam channels both go up to a current rating of 20 Amps each.